Donald Trump claims to be worth billions of dollars, but the tax records for his foundation reveal he gives very little of his fortune to his own non-profit. In 2009, Trump donated nothing. In 2008, he contributed $30,000. It doesn't add up to much when you consider the billions of dollars donated by fellow billionaires Bill Gates, Warren Buffett and Ted Turner. 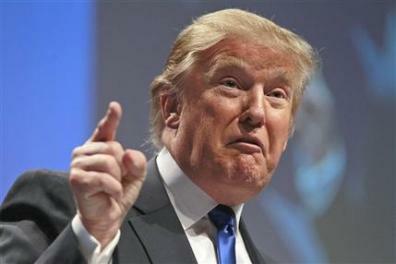 It's unclear how much Trump has given to charities overall, perhaps many millions of dollars. However, it's clear that the Donald J. Trump Foundation relies on the generosity of others, not Trump. From 1990 through 2009, Trump has personally donated a total of just $3.7 million to his foundation, which was incorporated in 1987. In fact, the billionaire is not even the largest contributor to his own charitable organization." The largest contributor to his foundation was World Wrestling Entertainment which gave the foundation $4 million in 2007 and another $1 million in 2009. According to Smoking Gun, "the real estate titan’s foundation has also banked $205,000 from media outlets and supermarket tabloids in return for exclusive photos (People magazine, for example, paid the foundation $150,000 in 2006 for the first shots of Trump’s newborn son Barron)." So, who got money from Trump's foundation? Well, much of it went to sports related charities, especially those connected to golf. 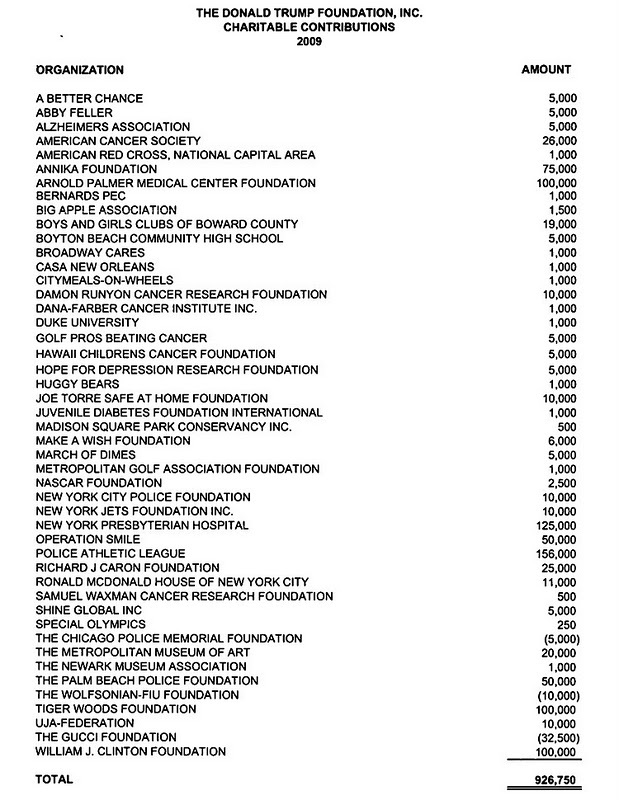 In the foundation's 2009 tax records, the foundation gave $100,000 to the Tiger Woods Foundation and $156,000 to the Police Athletic League. Many of his donations seem comically small, including the $1,000 he gave to Duke University, which has a $5 billion endowment. 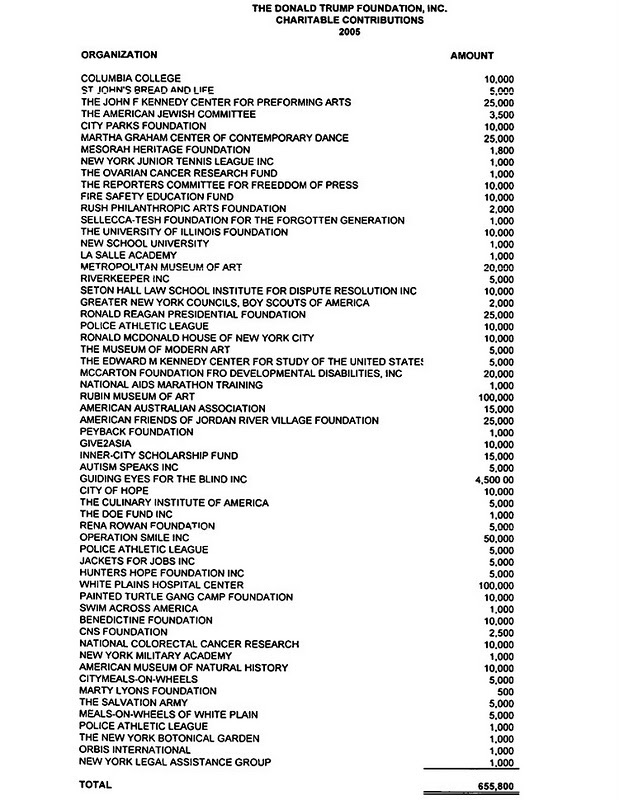 In 2009, Trump's foundation also donated $250 to the Special Olympics. 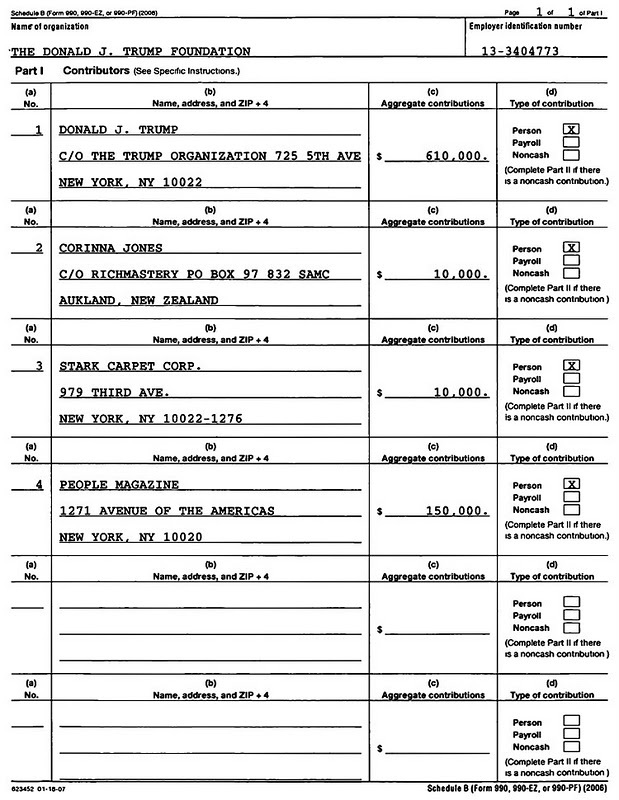 In all, the Donald J. Trump Foundation donated $926,750 in 2009. 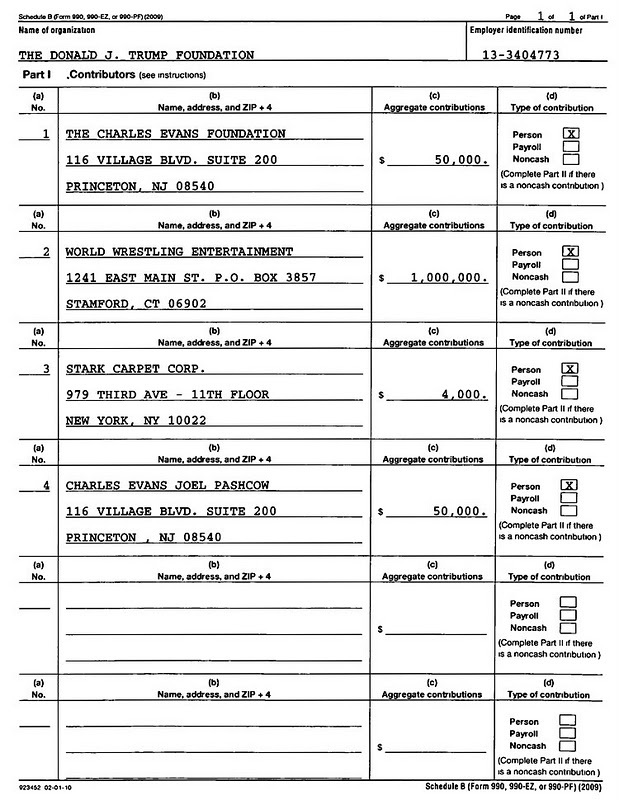 In 2008, according to tax records filed by Trump's foundation, Trump donated $30,000 to his foundation. 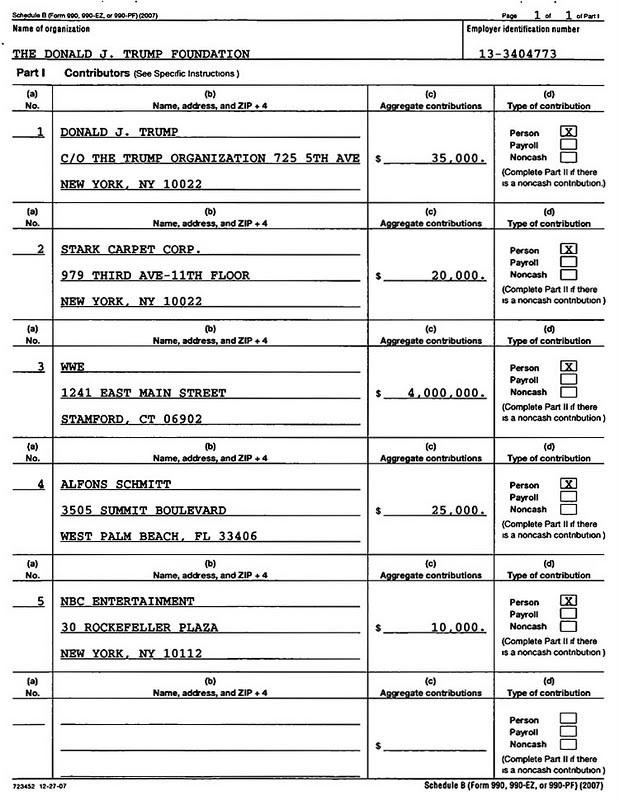 That year, the Donald J. Trump Foundation donated $731,500. Only one donation is worth more than $50,000. The foundation gave $107,000 to the Gucci Foundation. Trump's foundation gave one of its most generous gifts of the year to his own son's foundation. The Eric Trump Foundation received $50,000. Most of the giving came in much smaller donations. The New York City Marine Corps Council and the Queens Library Foundation received $350 each. The Rogue Valley Hockey Association received a gift of $250. 1 response to "Is Donald Trump the least charitable billionaire"
this is just one of the reasons i dislike him and his phoney family! shame!